Small volumes of anti-FUK antibody vial(s) may occasionally become entrapped in the seal of the product vial during shipment and storage. If necessary, briefly centrifuge the vial on a tabletop centrifuge to dislodge any liquid in the container`s cap. Certain products may require to ship with dry ice and additional dry ice fee may apply. Function: Takes part in the salvage pathway for reutilization of fucose from the degradation of oligosaccharides. Similarity: Belongs to the GHMP kinase family. MBS9604808 staining Hela cells by IF/ICC. 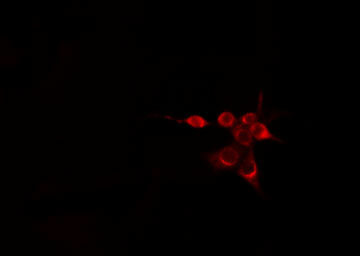 The sample were fixed with PFA and permeabilized in 0.1% Triton X-100, then blocked in 10% serum for 45 minutes at 25 degree C. The primary antibody was diluted at 1/200 and incubated with the sample for 1 hour at 37 degree C. An Alexa Fluor 594 conjugated goat anti-rabbit IgG (H+L) antibody, diluted at 1/600, was used as secondary antibody. 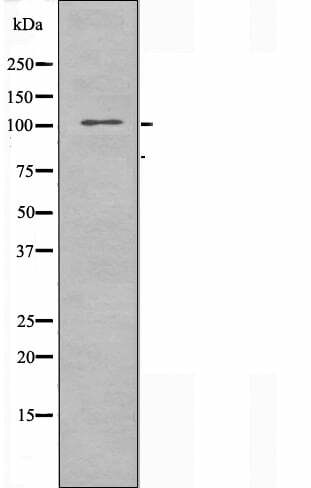 Western blot analysis of extracts from COS-7 cells, treated with insulin (0.01U/ml, 45mins), using FUK antibody. NCBI/Uniprot data below describe general gene information for FUK. It may not necessarily be applicable to this product. Takes part in the salvage pathway for reutilization of fucose from the degradation of oligosaccharides.